» Sort Your Life Out! With These Free 3 Apps. Sort Your Life Out! With These Free 3 Apps. Any.do is a task management appliction available across many platforms, including Google Chrome, Android, Mac computers, and iOS devices. 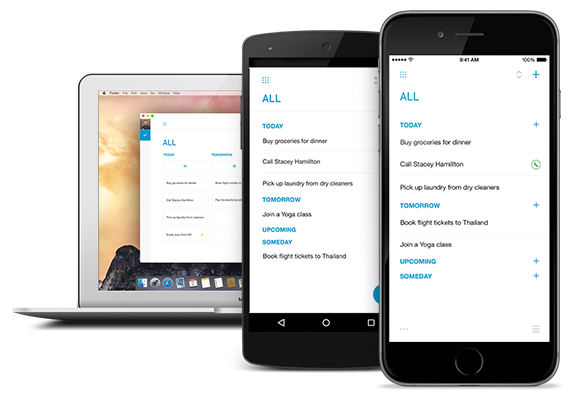 With it you have the ability to do simple daily planning and sync your schedule across all of your devices. It includes specific sharing features, allows you to set reminders within your day, and gives the option to make certain tasks as “recurring” throughout a specific time period. Any.do utilizes a voice-to-type feature so that you can conveniently tell it which reminders and tasks you would like to set. Another useful feature offered within Any.do, is the ability to delegate tasks within a group of people or family. This is done by sharing a to-do list with selected people, and managing which person will do each task. Any.do is a unique, simple to use task management app which will help maximize collaberation and productivity in day-to-day life. Available for both Android and iOS, this entirely free productivity app will help you in areas from creating grocery lists to setting reminders of upcoming events. When creating lists, Google Keep allows you to check off every item as you go through your day, and keep track of remaining tasks or items. All notes, lists, and reminders can be color coded so that they may be quickly retrieved according to their specific purpose. Lists and reminders on Google Keep can easily be shared with members of your Google contact list, making collaboration quick and simple. Along with planning your day and creating lists, Google Keep allows you to save pictures, notes, and audio recordings within its layout. This creates optimal organization of all ideas and planning, so they will never be lost. Google Keep is overall one of the simplest task management apps out there, but also one of the most user friendly and effective. Todoist, like most task management apps, provides your standard features including creating lists and setting reminders etc.. It is available for Android, iOS, and Windows smartphones, as well as most web browsers. Along with the others mentioned, it also allows you to share your created lists with other people so that you may collaborate on various tasks. Unique to Todoist though, is its convenient smartwatch compatibility, which makes viewing current tasks and reminders quick and easy, while keeping you up to date on any other related notifications. Todoist is also unique in that it features a point reward system (called Karma) so that you may visualize your productivity trends. Todoist allows for you to customize the priority levels of each task, and also allows you to set recurring tasks within a time period. Through the use of optimal task organization and entertaining rewards system, Todoist provides a well rounded set of features to assist in your everyday lifestyle planning.